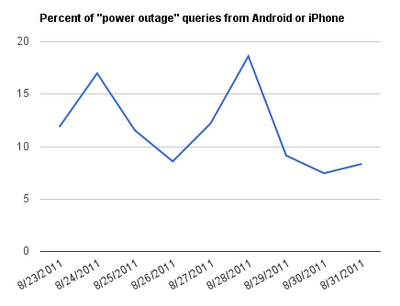 We also found that certain searches were particularly likely to come from smartphones, like [power outage]. The chart above shows two spikes in searches for [power outage] that came from smartphones on the East Coast: one on August 23, the day that a large earthquake in Virginia disrupted power in many East Coast cities; and one on August 28, the day after the hurricane made landfall. At its peak of 18.6 percent, this particular search is several times more “smartphone-oriented” than the typical queries we saw those days. Perhaps this was driven by people affected by power outages who did not have desktop computers available to them. Thankfully, Hurricane Irene wasn’t as damaging as had been predicted, but we’re glad to see that our products on these smartphones are really useful when disaster strikes. Anyone who has a smartphone knows what a valuable resource it can be in day-to-day life; getting directions, sending e-mails, video chat, sharing photos and more. You might be excused for forgetting that smartphones can even let you make phone calls! As these devices become more popular, we’ve seen a meteoric rise in mobile search activity—five-fold worldwide in just the past two years. But what about when day-to-day life is interrupted by natural disaster? Prompted by Hurricane Irene in late August, we decided to look at what was going on with mobile searches as the storm made its way up along the Eastern Seaboard of the United States. For one, we found that a larger-than-expected amount of hurricane queries came from smartphones, in particular, Android devices and iPhones. From August 22 to 28, 9.7 percent of all hurricane-related searches were made from these devices. This speaks not only to the growth in popularity of smartphones, but also to the innate utility of a supercomputer that’s always with you.